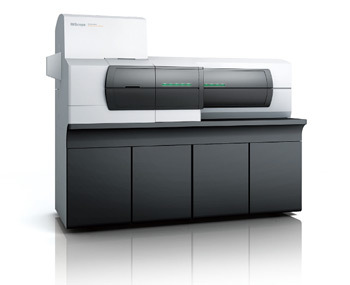 Imaging mass spectrometry is a revolutionary new technology. The instrument is a combination of an optical microscope which allows the observation of highresolution morphological images, with a mass spectrometer which identifies and visualizes the distribution of specific molecules. Superimposing the two images obtained based on these very different principles,has created a significant new research tool, the imaging mass microscope. The accurate and high resolution mass images from the iMScope will drive your research to the next level. At long last, we have entered the age of imaging mass spectrometry. 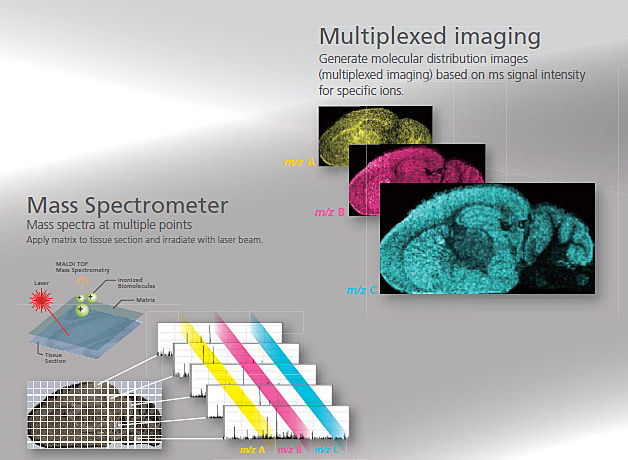 Imaging mass spectrometry directly detects both natural and synthetic molecules in tissue sections and measures mass spectra, while retaining their positional information associated with the tissue section. Then, two-dimensional distributions of specific molecules are visualized by combining the positional information of each mass spectrum and the signal intensity for specific ions in the mass spectrum (MS imaging). The iMScope TRIO imaging mass microscope is an instrument designed specifically for imaging mass spectrometry. It represents a hybrid type microscope that combines both an optical microscope and a mass spectrometer. The iMScope TRIO now makes it possible to identify various substances directly in tissue samples and expands the potential research opportunities in a wide variety of fields.